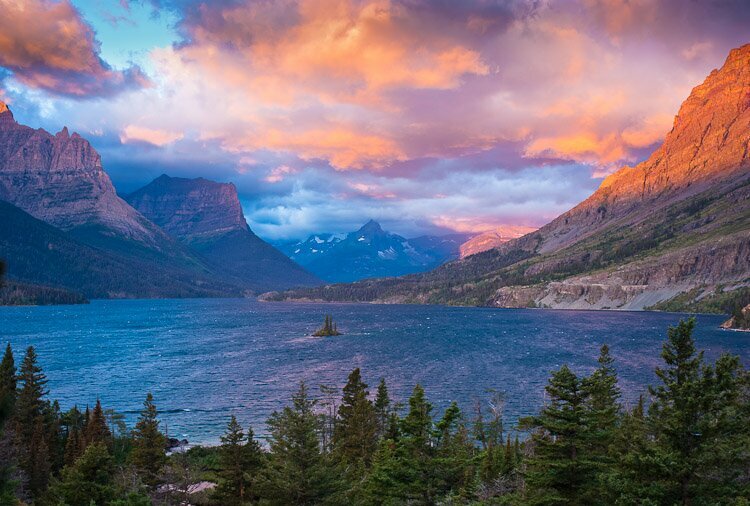 The scenery in glacier is unique and spellbinding. Glacier, however, is one of the most problematic weather areas in the country, as it just happens to exist at the very point where moist Pacific storms often run head on to cold masses of arctic air sneaking across the border from Canada. It’s often cloudy and/or windy, particularly on the eastern side of the park, where the lion’s share of the most spectacular scenery resides. It was mostly cloudy the entire week I was there; it even rained from dusk to dawn one day; and it blew like crazy on three remaining days. While it would have been nice to have a tad more sun, the clouds were preferably to straight sunshine, as they added drama to the scenery. The wind was fairly unpleasant, but there are places, nestled in deep canyons, where the wind abates, and one escapes the full blasts of 40 mph gusts. On the day before Labor Day, when I arrived at Glacier, it was snowing at the higher elevations; and at East Glacier, where I stayed for the night, I woke to find a sheet of ice attached to my wind shield. Curiously, the weather has been conventionally “good” the past week at Glacier, with blue skies and a minimum of wind accompanied with mild temperatures. While a minimum of wind is always welcome anywhere you go, Glacier is at its best with sun lighting upon dark, looming clouds.